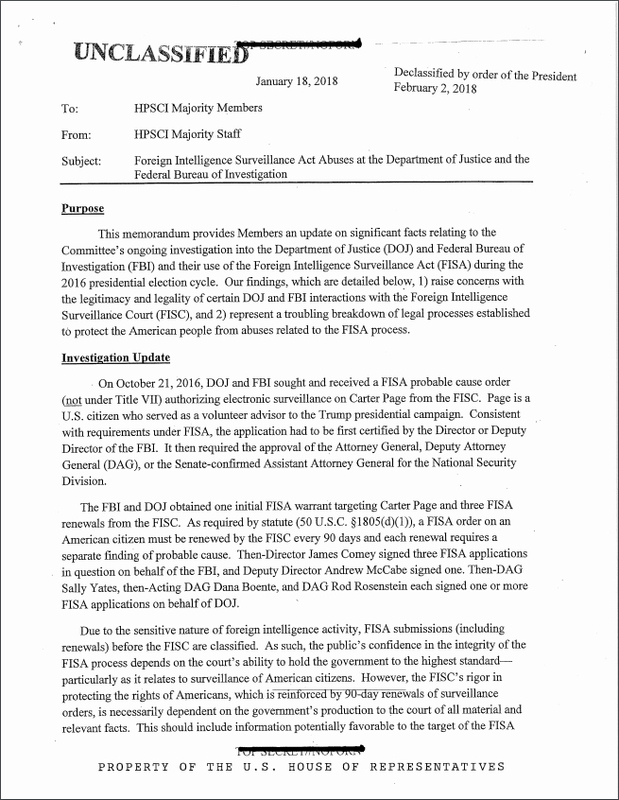 We have waited for months on end to see evidence of the true motives of the FBI and other official agencies regarding their actions before and after the 2016 election season. We wanted to know whether or not the claims made by secret service members, by various, anti-Globalist D.C. officials, and by President Trump himself were substantiated. These claims alleged that government offices were corrupt and were working not to uphold the law itself, but were, instead, working for monetary interests to undermine the election and duties of a presidential candidate (both before and after his election). According to the recently declassified memorandum on these subjects, these claims appear to be true. The social, political, and media aftermath of the 2016 election was turbulent, to say the very least. Aside from the consistent signs of media compromise, Washington and FBI officials were caught up in some very scandalous situations. Adding to the confusion was a grossly bias and compromised corporate media that was suspected and later proven to be working for the financial powers that lost the 2016 election. As it turned out, it was not only the corporate media that was compromised by Clinton-friendly financial interests. According to multiple sources, it was multiple factions within the FBI, CIA, and various other government offices. For these past months, the American people have been deceived into believing half-truths and in many cases, proven lies, about the Trump presidency. As virtually every tool of the divide-and-conquer, Hegelian dialect was used to foster hate for Trump, many Americans remained unaware of the fact. However, there were many who became very suspicious of the motives of the corporate media and the government offices within these matters. It does appear that a number of issues have arisen since Trump's inauguration. However, the corporate media appears to have ignored these chronic issues until after Trump was elected. It was clear, even before Trumps inauguration, that the corporate media was predicting and even seemed to hope for the failure of the newly elected President Trump. Despite our own personal opinion of the President, in civilized society, there is a certain code of conduct—for both citizens and government officials—for how we behave and how we treat elected officials. 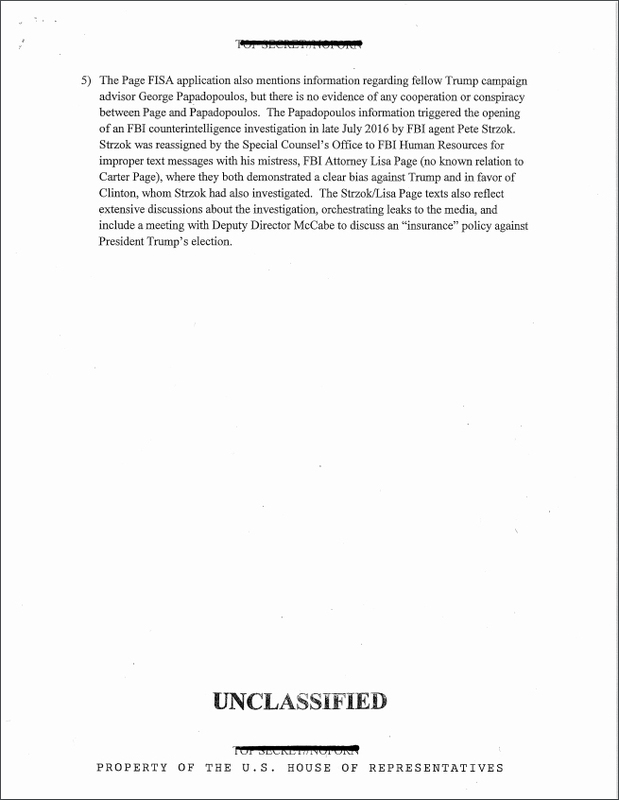 Not only were these standards grossly violated by citizens, by mainstream media, and by government offices alike for over a year straight, but multiple U.S. government offices were allegedly weaponized against their own Commander in Chief. 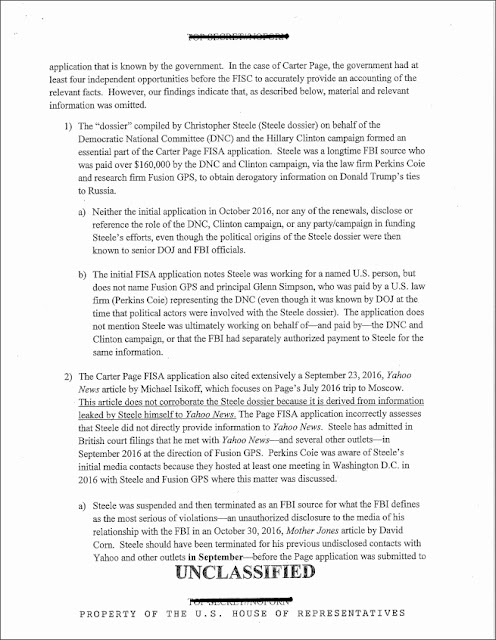 Related links - "Explosive", "Shocking" And "Alarming" FISA Memo Set To Rock DC, "End Mueller Investigation"
This is the memo itself which is proposed to hold the proof necessary to reveal the criminality of those who have seemingly betrayed the United States. Though this betrayal does appear to be factual, the entire story behind the memo has yet to reveal itself. 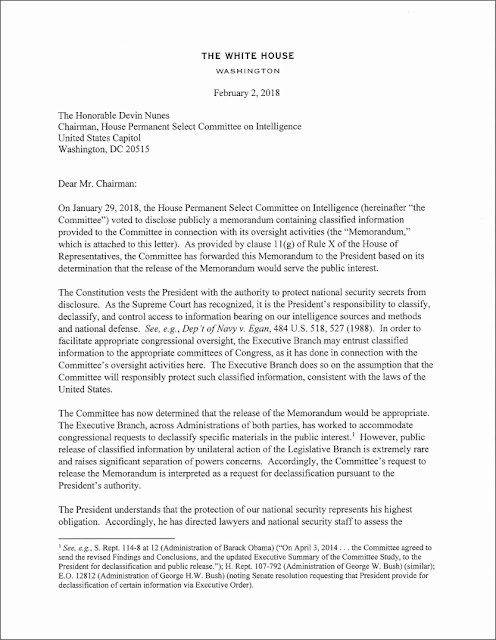 We may note the statement which reveals that the President holds the authority to classify and declassify any information he deems pertinent to the benefit of the people. 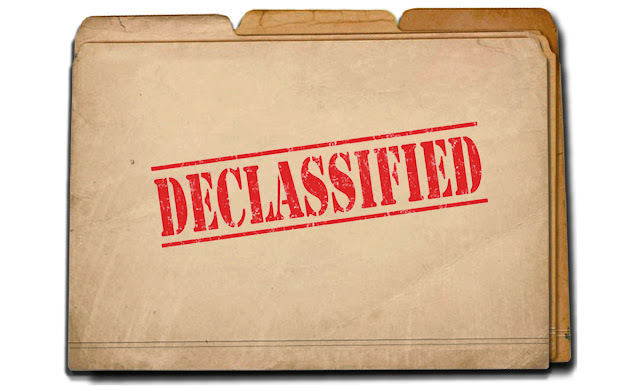 It appears that so far, President Trump has used this power to declassify the entirety of the JFK assassination information (according to reports), which opened the eyes of thousands of Americans to the true motives within corporate media and past administrations to deceive the American public. Now we have President Trump revealing the secrets of the infamous Mueller investigation. 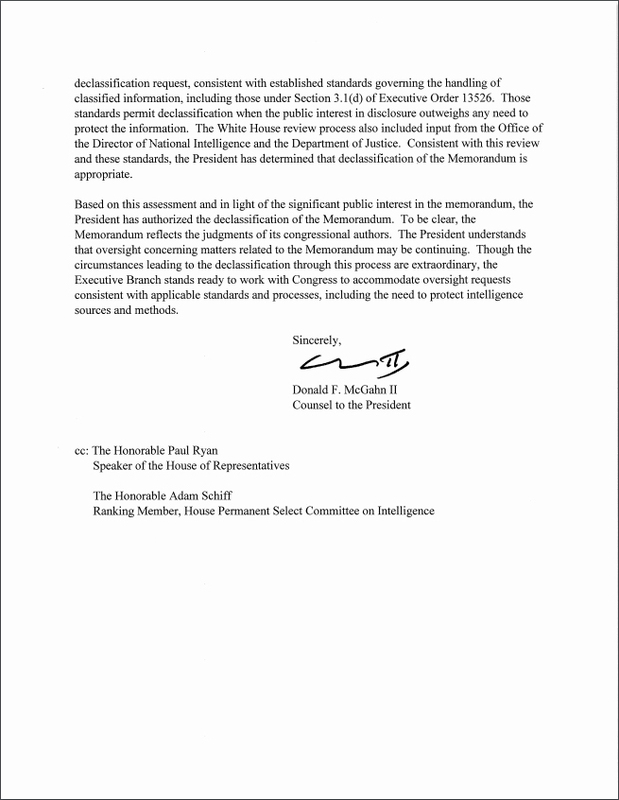 We may do well to consider whether or not this memo was classified for strictly procedural reasons. 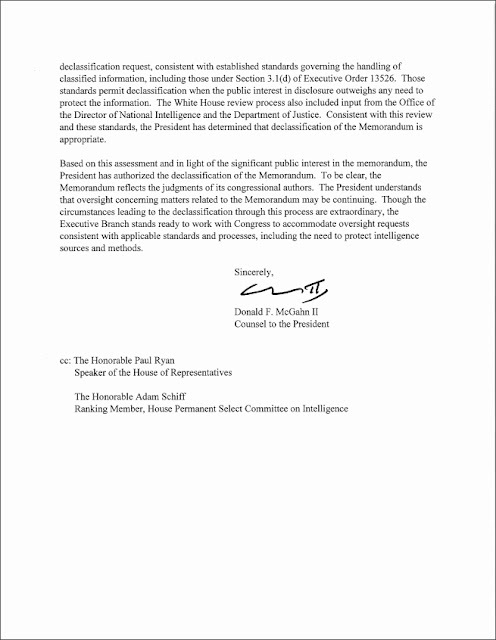 Either way, if the President himself had full access to resources which could easily reveal the fraudulence of this investigation, but could not reveal any of this information due to procedural restrictions, this would be particularly frustrating. This aggravating position could easily anger a person, especially if that individual had to wait for months on end to do anything about such a fraudulent case. This may have been a reason why Trump took to Twitter so often to vent his frustration. On the other hand, as mainstream media suggested, Trump may have been nervous that his nefarious motives would be revealed by the Russian investigation. This does not seem likely, in my view, as the corporate media has provably been subject to the will of government since the 1960s, and has faithfully hidden the misdeeds of every past President since JFK. In this way, neither the media, nor any other aspect of government have proven themselves more reliable than the wild-card we know as President Trump. For these reasons, it seems the situation requires us to maintain an open mind. The above memorandum appears to be as substantial as a document can be. Many opposers of this declassification argued that it was flawed in some way. 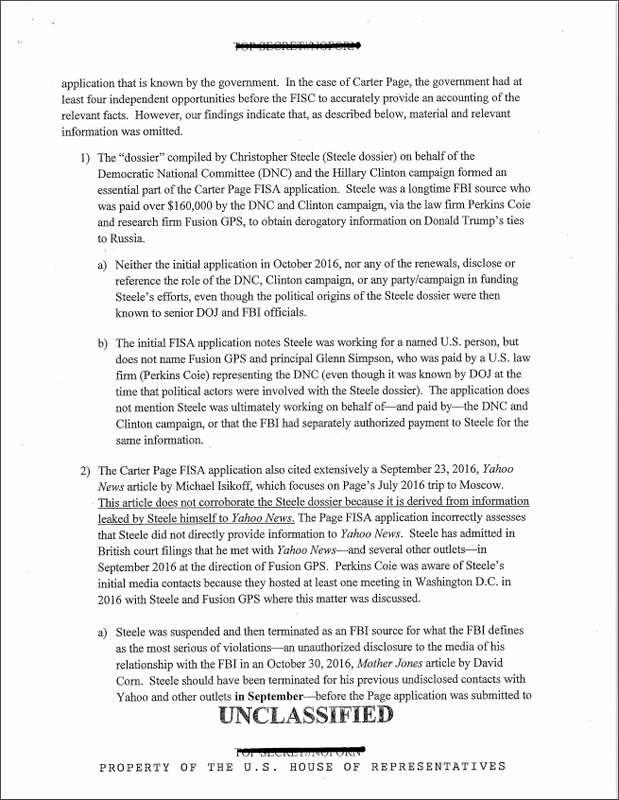 Yet at the same time, these critiques fought to prevent the memo from being released. This resistance appears to be fueled purely by fear of what the memo might reveal, and considering its contents (if true), it is not difficult to see why they were so resistant to it. 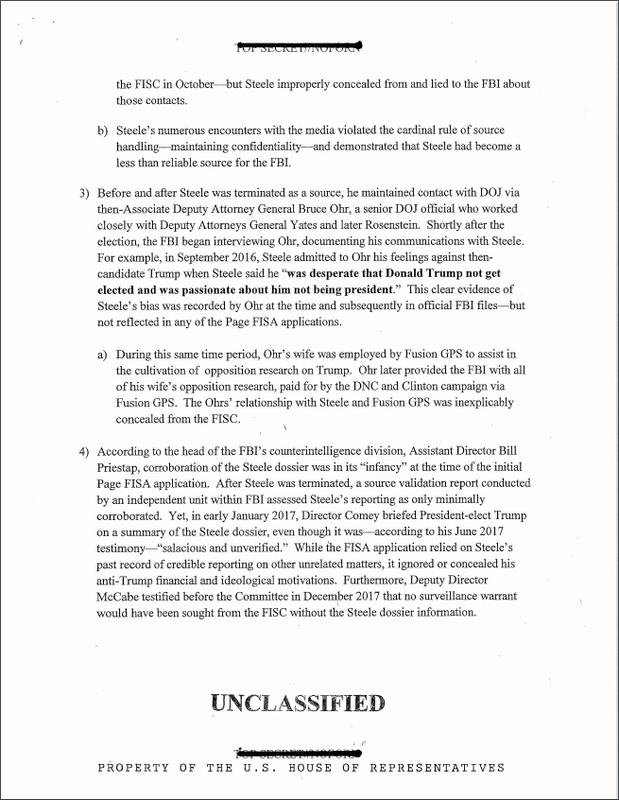 Immediately after the release of the memorandum (and even before its release), Democrats were frantically protesting the disclosure of this information. It seemed that various parties were both concerned about supposed mistakes within the memorandum as well as its potential to mislead either the general public or authorities in investigating the allegations it presents. However, when considered, these concerns do not seem to add up. 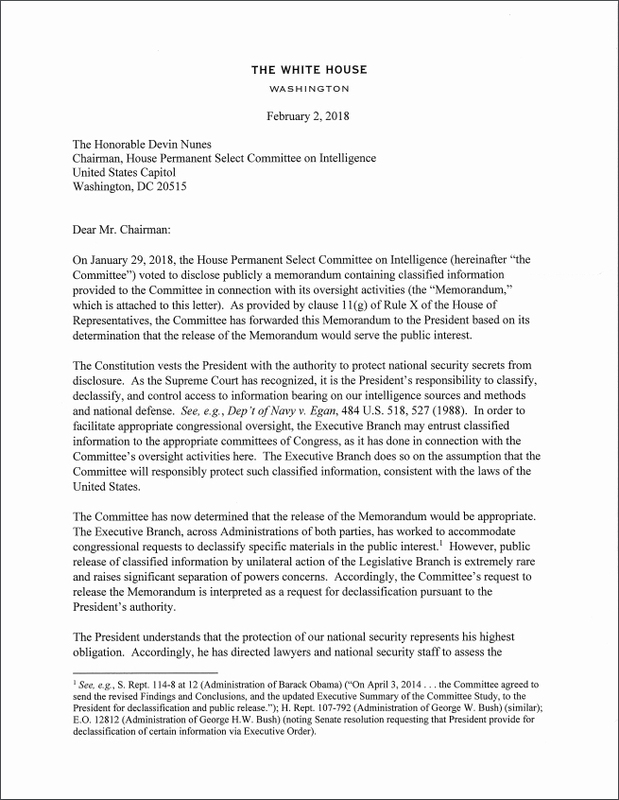 If there are true mistakes and inconsistencies within the memo, these will easily come to light upon closer investigation. Such supposed mistakes could easily be seen by any professional examiner into the situation. This would mean that Democrats would have nothing to be afraid of unless they are provably guilty in some way. As long as we the people hold officials accountable, and as long as we do not allow a bias media to sway our opinions in the direction of the gross government corruption of past administrations, the process will be sound. 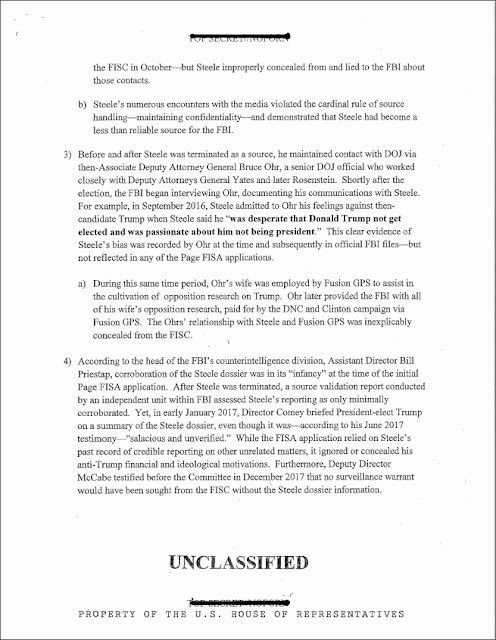 According to the document, numerous FBI officials involved with the supposed investigation of Russian collusion were corrupt from the beginning. 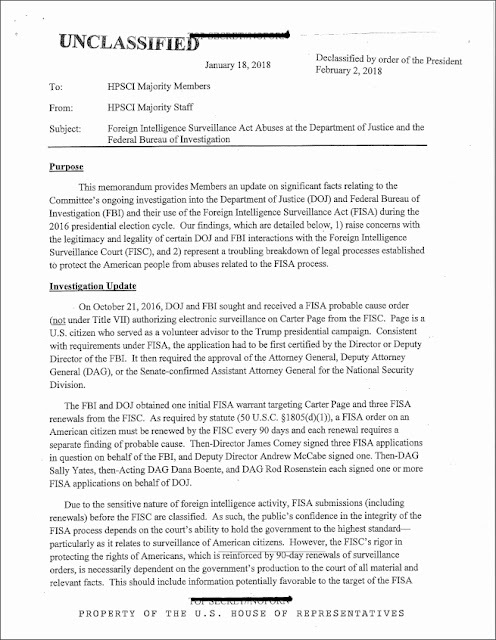 Many of these individuals were found, themselves, to be colluding with the DNC and the Clinton campaign to actively undermine the Trump campaign in any way they could. This involved illegal media leaks, bribery, extortion, and numerous other crimes, according to sources. If the Mueller investigation were an actual legal investigation, why would it need to break so many laws and undermine due process in order for this pseudo-investigation to succeed? Having cut so many corners and broken so many laws (allegedly), it is particularly ironic to still see these perpetrators fail. This situation is no longer about whether or not the people like President Trump's personality or whether or not we have seen his tax return. The situation appears to be about whether or not government officials and the American people have enough respect of the law itself to ensure that due process is upheld. If it is this easy for the Federal Bureau of Investigation to be bought out, where is the inconsistency that caused such gross failure on so many levels? If the corporate media is busily singing the song that Donald Trump is the only problem that exists in America today, how trustworthy are they in their complete failure to objectively investigate this scandal as it took place? If the DNC bought the corporate media, bought the FBI, and bought whatever procedure was necessary to undermine due process, why have we not seen those investigations? If we as the general public desire to see improvement in our society and in our world, it is important for us to think for ourselves. It is also necessary for us to become active toward building a better society. This does not necessarily mean voting or calling our congressman every day. It means realizing that offices and titles are only as benevolent and beneficial as we demand them to be. When an entire country blindly follows in lock step with a corporate media that has demonstrated such gross dishonesty and compromise of ethics, this is a problem. When this corporate media ubiquitously tells us to hate our President while completely ignoring every other problem in the U.S. government (both past and present), this is a problem. If we desire justice, we must honor it. If we want reliability in office, we must exemplify it in our everyday lives, and if we desire to have a system based upon integrity, it is we who must demonstrate this integrity on a personal level. Only when we choose to honor these qualities can we demand and/or appreciate them in any authority or official we depend upon. Moreover, when we do possess these qualities ourselves, we begin the obsolesce the need for elected officials who make our choices for us.